Domino is a fixed length, metal strap security seal with a polypropylene locking head, featuring a unique, clear inspection chamber. Suitable for use with tankers, containers, railcars, refineries etc, available in boxes of one thousand seals. Optional custom laser marking is offered, with delivery within 5-10 working days. Place your order below now and if you choose to customise we will contact you shortly, to discuss your print requirements. 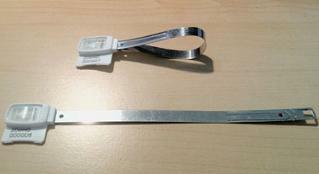 185mm fixed length, metal strap security seals. 8mm width, with optional custom laser marking available within 5-10 working days. Stock version, 1,000 seals @ £117.00 per box excl VAT. Customised, 1,000 seals @ £127.00 per box excl VAT.